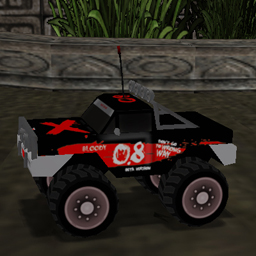 A black monster truck with red decals. Really soft parameters. It was intended to be the successor of another car of mine: Alpha (formerly known as 0.8 Alpha). Body was based on BigVolt a bit, and wheels were borrowed from Pix Skull.